Mrs Walsh has every reason to feel very proud of her department today as Art is a winner! Year 7 and 8 pupils were invited to submit artwork to go forward to the 2017 London Fourth Plinth Competition. We were invited to attend a ceremony at City Hall as a pupil had had a piece of work taken forward. …people think that art always has inspirational meaning behind it…this was just a fun bit of sculpture! 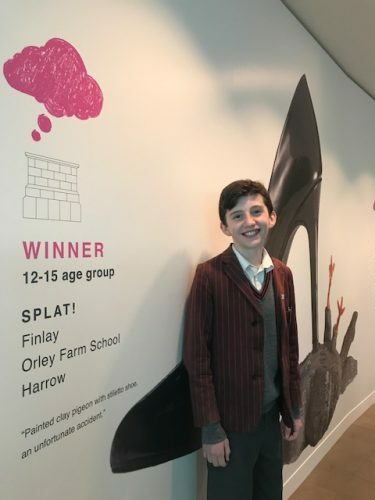 Mrs Walsh should be doubly proud as whilst we were at the prize giving event, Anaya, who left us last year to attend St. Helen’s won a group prize…well done Finlay, Anaya and Mrs Walsh for their creativity, risk-taking and resilience!